Cafès Pont, here since 1952 and still a brand of reference in the coffee sector. Working with passion, experience, innovation and quality. The mission of Cafès Pont is to successfully convey the high level of care, detail and quality which is present throughout all of their product ranges. The brand has been a market reference of quality for more than 60 years. This can be seen in the quality control and extreme care they put into the entire production process; from the selection of the best coffee beans at the point of origin, to their direct importation, to how they’re roasted, all the way down to the packaging of the final product. Quality and excellent service, in addition to the care taken in the design and presentation, have turned Cafès Pont into a brand of reference in the national market which, furthermore, counts on an excellent predisposition for growth through international commercialization, mainly in the European market. For some years, this coffee-making firm has counted on the experience of Lifting Group as a Consultancy and Agency for Strategy and Marketing. Demand on the part of the client lead us to successfully define a Strategic Marketing Plan for their territorial expansion, and a Communications Strategy which, in addition to a total revamp of the corporate identity and the creation of the online store, has resulted in an increase in the value of the coffee-making brand’s business. All of this was achieved by a multidisciplinary team of consultants who have developed an Omnichannel Strategy together with the client’s Marketing Department. Definition of a marketing and sales strategy, identifying objectives as benchmarks for consolidating a sustained growth. Restructuring of the range of products, with the introduction of new products, seasonal products and complementary products. Identification of the most relevant data to analyze the meeting of objectives. Redefine the identity of the brand and optimize communications support. Strengthening of the business through territorial delegations and international expansion. Fulfilling the need for a strategic vision with respect to brands, channels and identity. Definition of new marketing, commercial and communications strategies, increasing brand penetration in the market. Increasing the brand’s sphere of influence through new company delegations as well as expanding brand presence in strategic markets. Restyling of the corporate identity and integration of this in packaging, commercial materials, vehicles, etc. Creation of new ranges of products and brands, highlighting the Do Tea tea in bulk, winning the award for best logo in Europe at the Wolda Awards. 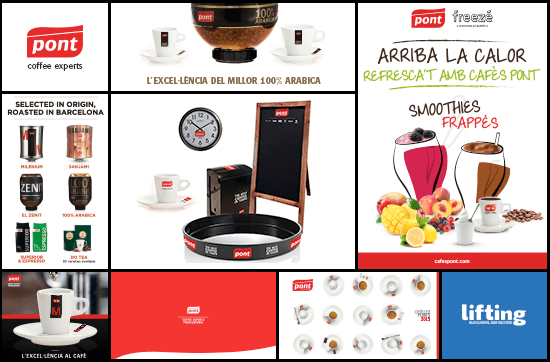 Top-of-Mind Awareness brand positioning in premium catering in the province of Barcelona. Incorporation of the online channel to support the consistency of the brand. Creation of the online shop. Creation of new seasonal product lines for summer as well as winter. Triple the amount of Cafès Ponts in the metropolitan area of Barcelona. Opening of a number of local offices throughout Spain. Successful participation in the two main food fairs of the world: Anuga and Alimentaria.